In my last post I showed how to get a readable execution trace of a process using a simple ptrace()-based tracer (itrace) and binutils' addr2line. By doing a bit more work we can extract the function call tree from the trace. In order to distinguish callers and callees, we can use the stack pointer (%esp), which itrace outputs. Believe it or not, this trace is quite illuminating. Working out that these calls will happen by reading the glibc source could take a long time! Firstly, it filters the trace to include only function entry points. We can just about infer function entry points from addr2line's output. We assume that when a function name (plus filename and line number) appears for the first time in the trace, the current address is the function's entry point. This doesn't work fully when inline functions are instantiated multiple times though. We could use nm to find symbol addresses, but addr2line gives us source filenames. Secondly, it works out the nesting of the call tree by looking at the stack pointer. # Ignore lines interspersed with other output! # point, and only report those entries from this point on. gdb can be really useful for debugging when it prints the information you want, but sometimes it will fail to give a useful backtrace, and it can be hard to find out what happened just before your process crashed. I faced that problem when porting glibc to Native Client. gdb (or strace -i) could tell me the value of the instruction pointer when the process crashed, but it couldn't produce a backtrace because it didn't know how to read memory with NaCl's x86 segmentation setup. (I should point out that gdb has since been ported.) Often I could look up the address with addr2line or objdump -d to find the cause of the problem. However, that didn't help when the process died by jumping to address 0, or when it jumped to _start when running atexit handlers. I found another way to do debugging, using a trace of the program's execution. So, here's how to create a debugger with a single shell pipeline (plus a small C program) that works on statically-linked executables. This tells us what happened before the program exited. In this case, it was executing exit() and flushing stdio buffers. Tracing debugging can often be more helpful than postmortem debugging. Debugging with printf is still popular, after all! However, single-stepping using ptrace() has quite a high overhead so this is not really suitable for longer-running processes. Potentially Valgrind could give us an execution trace more efficiently using its dynamic translation approach, but that would still be quite slow. Modern x86 CPUs have a "Branch Trace Store" feature for recording address of basic blocks as they are executed which has the potential to be a faster method, and there is a proposal to make this available in Linux through the ptrace() interface. Back in January I wrote that I was porting glibc to Native Client. I have made some good progress since then. The port is at the stage where it can run simple statically-linked and dynamically-linked executables, from the command line and from the web browser. This has not involved modifying Python at all, although I have added an extension module to wrap a couple of NaCl-specific system calls (imc_sendmsg() and imc_recvmsg()). 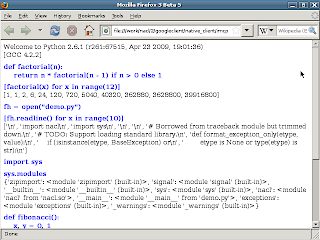 The Python build runs to completion, including the parts where it runs the executable it builds. A simple instruction-rewriting trick means that dynamically-linked NaCl executables can run outside of NaCl, directly under Linux, linked against the regular Linux glibc. This means we can avoid some of the problems associated with cross-compilation when building for NaCl. Adding support for dynamic loading of code. Initially I have focused on just making it work. Now I'll focus on ensuring this is secure. Making various changes to the NaCl versions of gcc and binutils to support dynamically linked code. Hopefully these changes can get merged upstream eventually. Some of the toolchain changes have already gone in. See the web page for instructions on how to get the code and try it out.